President Bush treated his final visit with Pope John Paul II in Vatican City on June 4, 2004, as a campaign stop. 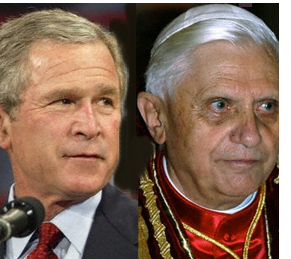 After enduring a public rebuke from the pope about the Iraq war, Bush lobbied Vatican officials to help him win the election. “Not all the American bishops are with me,” he complained, according to the National Catholic Reporter. He pleaded with the Vatican to pressure the bishops to step up their activism against abortion and gay marriage in the states during the campaign season. About a week later, Cardinal Joseph Ratzinger sent a letter to the U.S. bishops, pronouncing that those Catholics who were pro-choice on abortion were committing a “grave sin” and must be denied Communion. He pointedly mentioned “the case of a Catholic politician consistently campaigning and voting for permissive abortion and euthanasia laws” — an obvious reference to John Kerry, the Democratic candidate and a Roman Catholic. Even with his atmospherics of terrorism and Sept. 11, Bush required the benediction of the Holy See as his saving grace. The key to his kingdom was turned by Cardinal Ratzinger.